Got $50,000 burning a hole in your pocket? 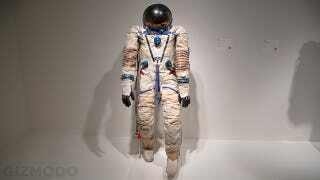 Consider bidding on this cosmonaut spacesuit — one of the many items up for auction at Sotheby's this weekend to support RED, Bono's HIV/AIDS charity. It's certainly more spendy than Buzz Aldrin's underpants, but it's for a good cause. How Much Would You Pay for Buzz Aldrin&apos;s Undies?